In honor of the much-anticipated premiere of The Handmaid’s Tale series on Hulu today, I am revealing my long lost high school fan-fiction, written from the perspective of the Commander’s wife. (And by “revealing,” I mean I’ll give you the #content but no way in hell am I publishing it under my real name). But yes, the terrible title “Tulips” is mine, along with the angst and overwrought prose that only a seventeen-year-old girl could produce. I first read The Handmaid’s Tale as an AP summer assignment while on a tour of China. I thought it would be ~subversive~ and—not to brag but—it was one of my most rebellious moments as a teenager. Thank you for Gilead, Margaret Atwood, and sorry to sully your words with mine. The oak door to the Commander’s office was closed, like it had been when I had called him husband; now I prefix that with “late.” I had often found myself wandering the corridor, willing the courage to open that door, to see the secrets he kept. It wouldn’t have garnered my disapproval; we were both trapped by our creation. What I would have given, what I would give, for the solace of a book, the convenience of a computer. With a steady hand, I grasped the doorknob, pushed, and entered. I didn’t bother closing the door. Only the maids, the cook, and the child remained. The last handmaid had departed the day before, off to a more virtuous commander, the kind who obeyed the laws he set, a man to father just one more child. I had never been inside the Commander’s office; it was his space. The husband had his business, the wife had hers; they were separated. We knew that; at one point, we believed that. In some way, I am expecting what I see– books, a computer, and books, books, and books. The computer remains perched on the desk; I wonder if there’s a password. I’m surprised by how much I remember. I amble to the books on their maple shelves, stroke their forbidden spines, decode their lettering; I can still read. I can still get out; however much I squelched my education, my independence, in my past, I can remember. I turn to the desk I now stand behind; he has books, what else is here? Would they have killed one of the highest ranking commander’s for a collection of books?—perhaps. There must be more. I hover toward the desk, open the drawers hungrily, rifle through papers. At the top are state papers; I don’t care to read those. As it seems like there is no space left to go, I feel the glossy pages of old magazines, the paper brittle but intact—a newspaper maybe, suede-like paper massaging my fingers. The state papers are jettisoned to the floor. I pull the magazines from their hiding place—Ms., Mademoiselle, Esquire, and Time magazine buried beneath them all, carefully paper clipped. I slip to the page and find that I am looking at myself: young, at a podium, preaching for what I have wrought. I didn’t know the cost of conservatism; I should have saved it for when I was old. Then, I longed for the past; now, I long for the past that was once my present. It is funny, the disdain I held for such magazines when I had the freedom to read them. The child is banging pots downstairs, Cora quieting her. The child has a name, Freja, but I only use it to address her, which is not often. I have neither the energy nor the conviction to speak to a three-year-old. She is not mine. They may say she is mine, but she is not. She is his, and hers, not mine. Let her tarry with the housemaids, jump off the stairs, read a book hidden in her father’s study, she will never be mine. Freja for her father—if she were truly mine, I would have named her Helen. This face, this mouth, launched a thousand ships, and now they regret what they have done; let her remind me. I shuffle through other drawers: more papers, financial matters, a game of Scrabble—none of which are of interest to me. I grab several books off the shelf; I don’t care which one’s they are—something to feed my emaciated mind. As I walk out the door, I glance at the authors: Maria Ranier Rilke and Sir Thomas More, neither of whom I’ve read. I don’t have the heart to check the computer; my profile is on there, but I choose not to see my fate. I am a wife but now, as a widow, I cannot prophesy my future; there is little precedent, but instinctively I know what will happen. I have been a pessimist since the moment I lost the power to define who I am. In a month, they will have no use for me and I will be exiled; look at what I have sown. For years, my life has occurred in three places: the bedroom, the garden, and, while I never set foot inside, the Commander’s office. The office held my past, the bedroom the present, the garden perhaps the future. I cleaned the bedroom this morning, hid the Commander’s possessions; I will have to abandon it to the new Commander who claims the house. The child and I will be relegated to two newly created guest bedrooms; a small step up from those of the handmaids. The maids have dusted the room, new sheets have been placed on the bed, all evidence of my habitation has been erased, although I didn’t have many belongings in there anyway. What I have is hidden in the floorboards of the parlor; money I have saved, names, organizations I have cultivated for years under the pretext of annihilating the opposition. That was my goal at one time. The child is screaming downstairs; she will not be allowed to follow me to the colonies, yet I will not be parted from her. As much as I cannot accept her, I cannot give others the satisfaction of knowing she remains; no, she will follow me. In their eyes, she is mine and, to them, that is enough. Perhaps as she comes of age she will be able to exert some free will, but as society stands now, she has none. Her father’s name would spare her the fate of her biological mother; she will be the foster mother, the pillar of sound judgment, society, demureness, and manners. 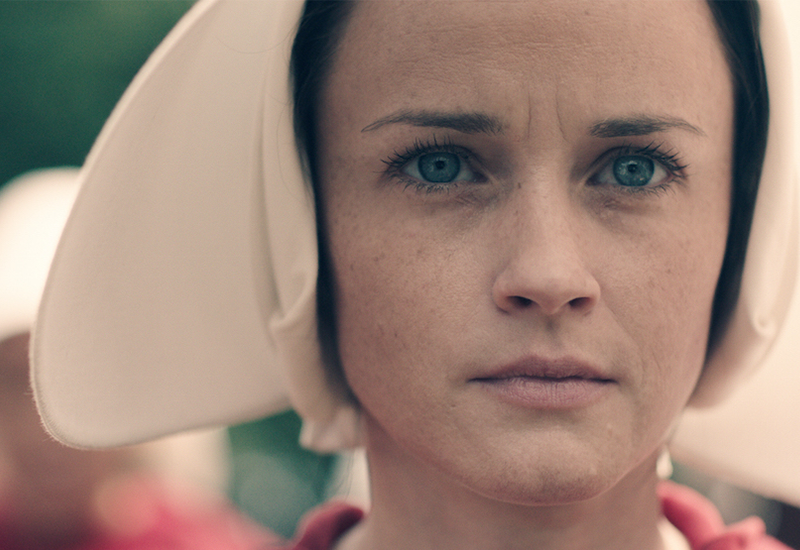 She will always be a wife and always wish she were a handmaid. I hurry to the parlor, a Time magazine and books clutched in my hand; I hope I am not caught, but by now I am too desperate to consider any alternative. I am not coming to deposit my new contraband, but to retrieve my belongings from the floorboards. They must be close to me, just in case; I have made my decision, for the moment, at least. The floorboards creak as I open them, grabbing the wad of cash, the names, addresses, numbers like a child who does not want to share. I find my way through the house to the new room; it adjoins to that of the child as I suspect they thought the child would want to be near her mother. I reiterate; I am not her mother, no matter what social mores dictate. Everything is left under the bed; they won’t raid the bedroom of an upstanding wife who helped to found this society. What fools we have been. I put on my hat and my gardening gloves, intent on viewing my prized tulips. The child has calmed; Cora will put her to sleep. I walk downstairs with the composure expected of me, walk outside, refusing to betray a single emotion; Eyes must be stationed here or else the Commander would not have been betrayed. Although I have felt no affection for the man in years, I do miss him; he was my protection. I reached the tulips in full bloom, and they look so beautiful, the perfect blossoms for my garden. So with tender care, I wrench the tulips from the ground, stomp my feet on those lovely petals until they are reduced to nothing more than pulp on the pavement.